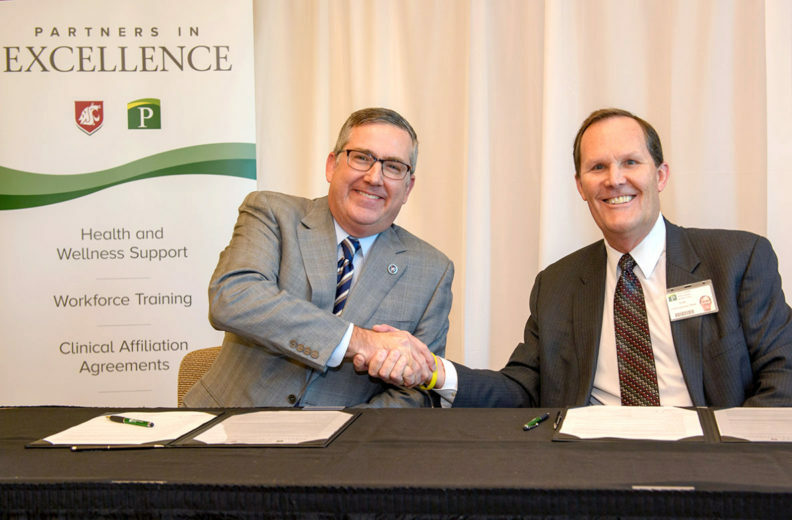 Pullman Regional Hospital and Washington State University announced an official partnership with the signing of a memorandum of understanding signifying a formal continuation of long-standing collaboration between the two public entities. A commitment to build healthier communities, unique to the region, including the WSU student population and an aging population in a rural area of the state. Mobilizing resources and sharing expertise can result in improved health outcomes in such areas as mental health, suicide prevention, stress reduction, healthy eating, substance abuse and violence prevention. To provide experiential training and mentoring to enhance opportunities for students from all of WSU’s health sciences programs, WSU College of Nursing, WSU College of Pharmacy and the Elson S. Floyd College of Medicine. As two major employers in the region, we will work together to coordinate and promote employment opportunities. To work with supporters of both organizations, including WSU alumni, to facilitate fundraising efforts for healthcare projects, such as the Rural Residency Training Track for Family Medicine Physicians. Through the hospital’s Center for Learning & Innovation and WSU’s healthcare and health science programs, provide joint research and project development on population health and advancement of care. Phil Weiler, vice president for marketing and communications, Washington State University, 509‑335‑1221 or phil.weiler@wsu.edu.